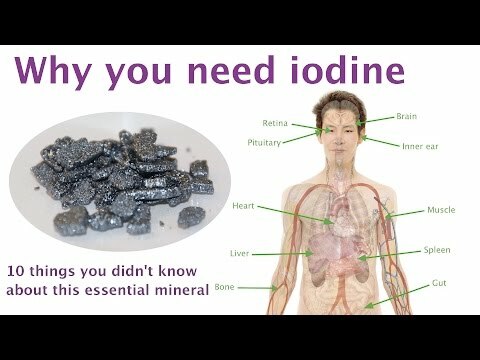 The Iodine Mineral is one of the family of trace minerals and as such, the body does not require large amounts of Iodine. However, the Iodine mineral is a very important element of several key body functions. In fact, Iodine was deemed to be so important that the US government passed legislation recommending that Iodine be added to table salt to ensure that Americans got an adequate supply of this essential mineral. As the iodine mineral is ingested, 75% of this mineral makes its way to the thyroid gland. Once there, iodine joins up with two important hormones that are produced by the thyroid gland: triiodothyronine and thyroxine. Every part of the body requires these hormones. Most importantly, they play a role in the body's ability to produce energy. These hormones control and regulate basal metabolic rates. In other words, they determine how fast and how efficiently the body is able to burn calories. Thyroid hormones are also what helps control a child's mental development and overall growth rate. Pregnant women who do not get enough iodine increase the risks that their newborn babies will develop some degree of mental retardation. If you ever had a bruise or cut as a child, your parent likely applied iodine to the affected area. That's because iodine is an effective antiseptic. In addition to helping clean and heal wounds, it will discolor the skin. Iodine is also used in hospital operating theatres for it's antiseptic qualities. Iodine is added to most table salt so people generally get the required amount from just one teaspoon of iodized salt. Other Iodine sources include seafood and sea plants such as kelp and seaweed. Fruits and vegetables grown in coastal regions are other good sources of iodine. Processed foods are not a good source of iodine as they typically are not made with iodized salt. The recommended daily allowance for adults is 150 micrograms/day. Women who are pregnant or who are breast feeding require more: 157 micrograms/day and 200 micrograms/day respectively.